On April 13 the U19 Girls travelled to Keswick to play in the IEM Tournament. With only 9 players, and one away Viperand one sick the Hurricanes had only 8 healthy players to start the tournament. Opening against the Kitchener-Waterloo, Huntsville came out strong but lost another player to illness in the second quarter. Down to seven players the entire team was supportive and pulled away to win 51 - 23. Riley Truax with 17 points, Emma McAlpine (10), Kaiya and Alexis Roberson (9) lead the team in scoring. Game 2 was against the Lindsay Wildcats who the U19 Girls beat by 8 points last month. Again with only 7 players the Hurricanes came out on fire and lead 38 - 14 by halftime and went on to win 62 - 31. McAlpine (20), Truax (18), Zoe Long (7) and Jenna Yeo (7) lead the team in scoring but the real star was the swarming team defense by all 7 Hurricanes. Game 3 was Sunday morning against Canada Elite. With Joey Currie back from illness and another U16 player helping out for the day Huntsville was up to 9 players. Again swarming defense and incredible transition offense lead to an early lead and the Hurricanes coasted to a 56 - 27 win. Currie (11), McAlpine (10) and Yeo (8) showed amazing balanced scoring with all 9 players getting on the scoresheet. The final round robin game was against the North Bay Spartans. This was a hotly contested back and forth game and came down to the last seconds. The Spartans prevailed in the end 47 - 46. Currie (21) and Truax (8) led the way in scoring. Despite the loss Huntsville qualified for the gold medal game against the Spartans. The gold medal game started with undermanned Hurricanes on fire. With Long out with an injury and two players playing with illness they raced out to a 17 - 5 lead. Unfortunately the physical stress of 5 games in two days started to takes it toll and when McAlpine went down with an injury late in the first half Huntsville had trouble executing on offense. 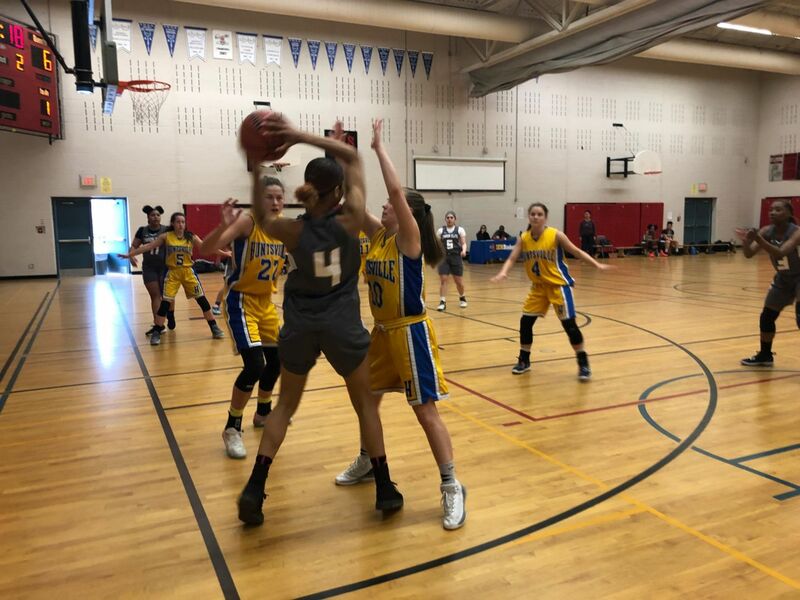 The Hurricanes battled to the end with great team defense at time with U16 players Grace Kujala and McKenna Allen holding their own together on the floor against girls 4 years older. Huntsville got the game to within 5 points with a minute to go but finally lost 38 -30 to win silver. The Hurricanes next play at home on April 28.